Egypt has a long history of using flowers for both decoration and as religious symbols. In the past, the Nile river valley was lusher and less desert like. There are many flowers shops scattered throughout Egyptian towns and cities, indicating that the passion for flowers has passed from antiquity through the modern age. Lotuses, and other flowers like water lilies, have been in Egypt since prehistoric times. According to Egyptian myth, ancient Egyptians once sang for the lotus at parties. Myth also suggests that there was once a day set aside as the feast of the lotus. The lotus was also named one of the national flowers of ancient Egypt. Lotus flowers grow in North America in United States Department of Agriculture (USDA) Hardiness Zones 5 through 10. Lotus grows from tubers that are planted in underwater soil. Depending on the type of lotus, the spread of a lotus may be between 4 and 8 feet. 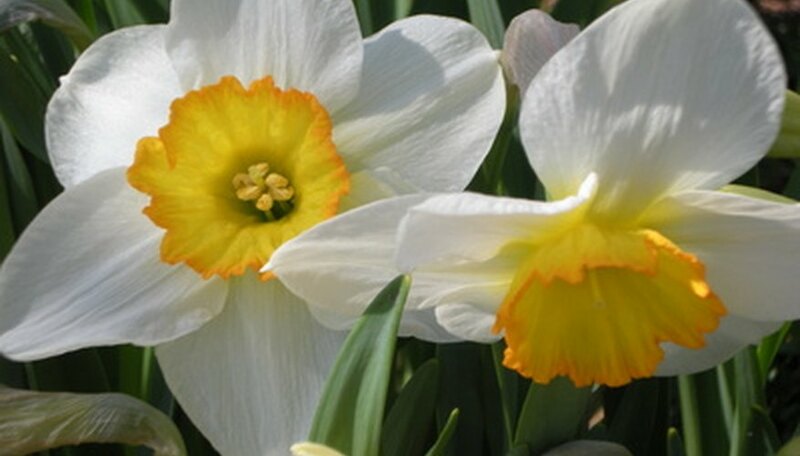 Narcissus has also been grown in Egypt since very ancient times. The remains of narcissus bulbs were found on the neck of the mummy of Ramesses II. Narcissus grows well in USDA Hardiness Zones 3b through 10. Narcissus grows to between 1 and 2 feet tall. They grow best in partial sun or partial shade and are planted using bulbs planted 4 to 5 inches deep. Bulbs can be planted in the fall and will winter over, becoming one of the first flowers to come up in spring. Water narcissus bulbs thoroughly after planting. Chrysanthemums occasionally served as a model for rosette shapes under the New Kingdom Period (1539 B.C. to 1069 B.C.). Chrysanthemums are also found in the tombs of the Middle Period (1986 B.C. to 1739 B.C.). Chrysanthemums can grow well in USDA Hardiness Zones 5 and warmer. It may, in some cases, grow in Zone 4, but may flower too late if left outside to overwinter. They will overwinter in warmer zones. Chrysanthemums should be planted just after the risk of frost has passed and do best in full sun. They are very tolerant of soils, but must be grown in soils that drain well. What is the Meaning of Stargazer Lilies?